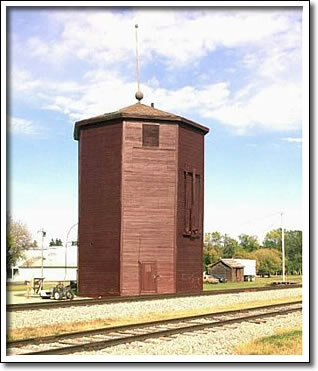 This octagonal wooden railway tower is a rare vestige from the age of the steam-powered locomotive. This design, the Standard No. 1 Plan was pioneered by the Canadian Pacific Railway (CPR) in 1903 to replace the low, round, wooden water tower in use since 1882. It quickly became part of the Manitoba landscape, with 75 water towers constructed by the CPR from 1902 to 1925. Towers, pumphouses, coal sheds, and sidings were constructed approximately every 80 kilometres (50 miles), the distance a steam locomotive could safely travel between water refills. Constructed in 1904, the Glenboro structure is the best surviving example of an intact, fully-equipped water tower in Manitoba. The adjacent pumphouse fed water to the tank inside the water tower. A coal-burning boiler powered an interior water pump and prevented the water in the tank from freezing. In 1939 this pumping mechanism was replaced by an electric motor and pump installed inside the tower. A ball, or "float", glided along a pole atop the tower to indicate the level of the water in the tank. The cedar water tank, with a capacity of 181,840 litres (40,000 gallons) of water, rests upon a framework of large wooden support timbers. By the late 1950s, the railway companies converted to diesel-powered locomotives which made the water structures obsolete. This tower once stored the community water supply for the Village of Glenboro.